Here's the Winter/Festive 2011 Collection from Debarun Mukherjee as seen at Lakme Fashion week. 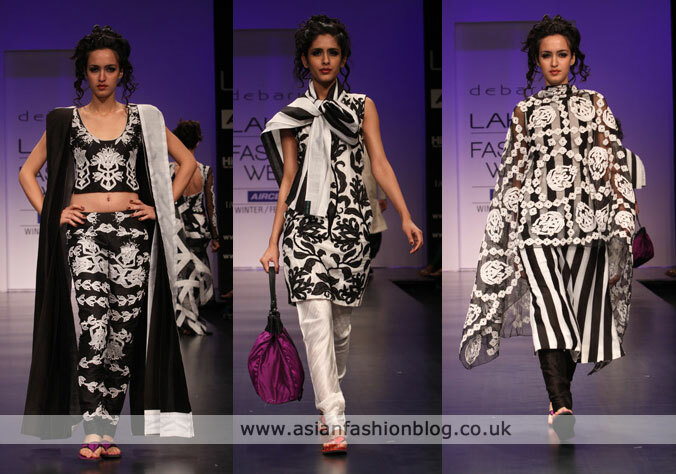 The collection was called "Kohl" and most of the pieces were purely black and white. The show started with a dress with eyes on it! This collection was a bit "hit and miss" for me, with some that I thought looked good and others which I wasn't so convinced by - like the vertical stripe outfit below on the right, which makes me think either humbug or prison uniform! You can view more from Debarun Mukherjee's Kohl collection, including the menswear pieces at www.lakmefashionweek.co.in. I recently received an outfit from Debarun Mukherjee's Summer Resort 2011 Collection, courtesy of Bombaypink.com so look out for my review of them soon!